Rain rain go away come again another day. Today was a doesn’t stop raining all day kind of day. I broke with my fashion sense and wore my lime green waterproof into Central London. It turned out to be a good idea! It seems like a long time since there had been a day like this, a curl up and stay in bed if you can day. It’s half term for me so I met up with Clare for a catch up. As a dear Norwegian friend is coming to stay tonight I thought the Nordic Bakery in Soho was the perfect choice! We both braved the rain and fought our way to the Golden Square. The Nordic bakery was rather inconspicuous and when we finally found the door among the camouflage of wood we found a rather sparsely decorated cafe with dark decor. There was a tasty display of cakes and rye bread sandwiches. I tried out a Danish salami and cheese rye bread roll and a Karelian Pie. The sandwich was hearty, heavier than a white bread roll and very mustardy! I couldn’t quite eat the whole thing. The pie was so unusual looking I knew I had to try it! A savoury potato pie with what I assume was a pastry case but it was so thin you didn’t notice it when eating. 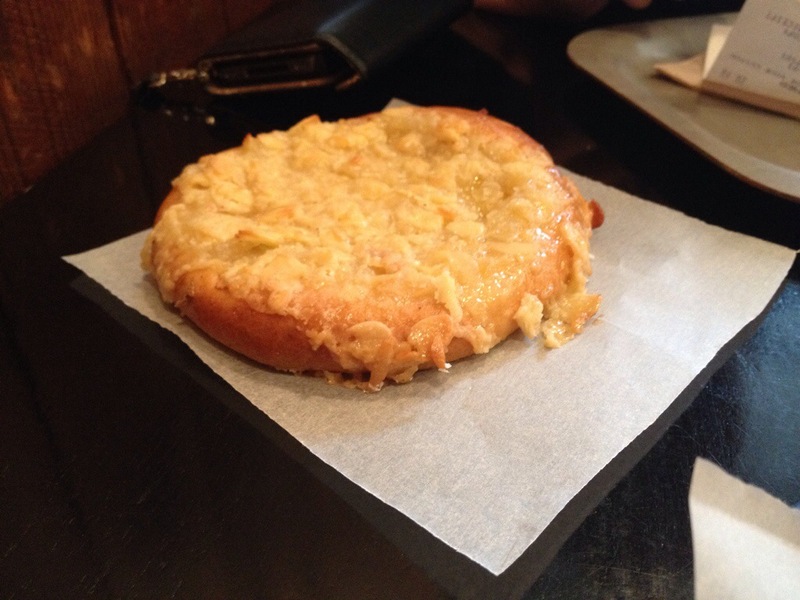 The filling tasted like buttery mash potato. The whole thing was rather like eating a cold jacket potato skin smothered in butter – a nice experience and I would quite like to see what the rice filling would have been like. Clare went for the quiche, perhaps a safer option, and it was good! Well that was lunch. We were already quite full by this point but we couldn’t leave without trying what we came for. This is a cake blog, not a lunch blog. So Clare want for the Apple Tosca Bun and I opted for the Tosca cake. Tosca it turns out is flaked almonds cooked in a layer of caramel. Yum. Clare’s bun looked tasty but lacked the apple taste she wanted. It lacked something special to make it stand out. 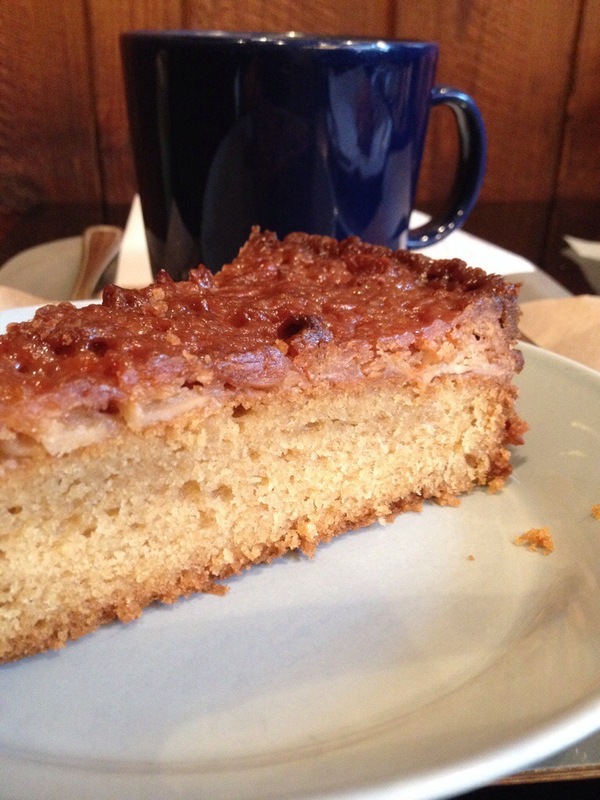 My Tosca layer was very tasty, not as crunchy as I expected, a layer of nutty caramel on top of the cake. The cake underneath was heavy and slightly on the dry side. If there is one thing I have learnt about Nordic eating it is that they like heavy stodge. I suppose this fits the climate, but it was still a bit too much for me in the English drizzle. My stomach was not happy with me after my meal. A combination of the rain outside, the sparse decor and two overfull stomachs inspired us to leave the Nordic bakery and seek the comfort of my flat where it was warm, dry and there was plenty of soft furnishings to lie out on! The Nordic Bakery, good for a hearty take away lunch, not one for a lingering catch up. Cake: Me 4 Clare 3 – perhaps very good recreations of Nordic baking, but not my cup of tea. Atmosphere: 3. They gain points for free water but could have been more friendly. How do you spend your rainy days? You know when you just feel like doing nothing? When the weather isn’t brilliant and everything seems too much effort. This was one of those weekends. I felt so lazy in fact that I couldn’t make myself write up my blog until Monday night. What with being so lazy, I didn’t want to venture far for cake. Del’ Aziz is the nearest we get to a ‘local’. Only 10mins down the road – or a 40min walk if you are us and far too lazy to get the bus. It is a Lebanese (amongst other things) restaurant that does a great brunch and a cake selection to die for! I realise as I write this that I should have taken a photo of the impressive spread of cakes and pastries that fills an entire corner of the cafe. The meringues are a sight to behold and I have only ever just about struggled through half of one before, they are the size of a human head. We arrived and helped ourselves to cucumbery minty water from the jug on the table. Anywhere that does free flavoured water on the table is immediately in my top 10. I love a freely provided jug of water. Amazing. It had cucumber in. I feel we chose poorly for our cake. There was chocolate truffle cake, which featured in an earlier blog, vanilla cake, red velvet, chocolate, Black Forest, every type of fruit tart, five types of loaf cake, an almond and blackcurrant slice, two types of cheesecake and that’s just what I can remember. It doesn’t include the brownies, muffins etc. I chose the orange and poppyseed and Charlie chose the banana loaf. n’t eaten lots of Del’Aziz cake before I would have been put off. The cake was just too dry. 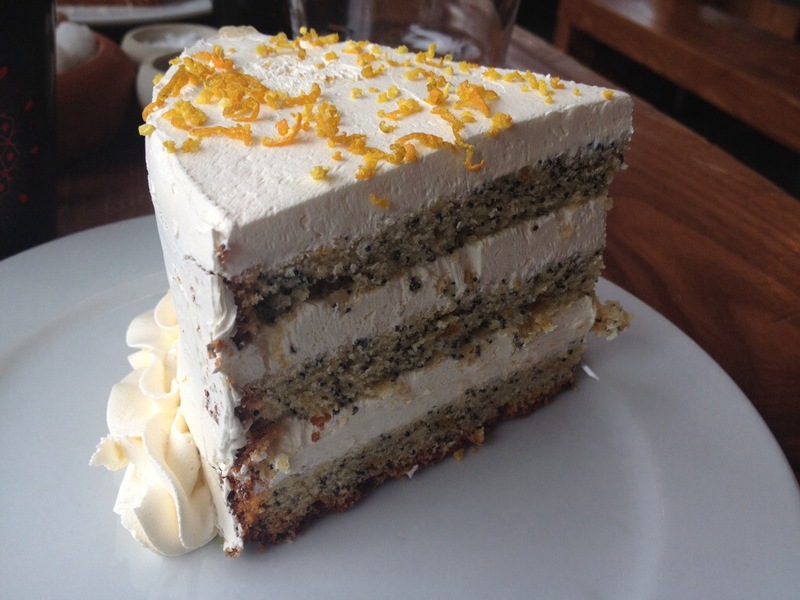 It had a strong orange flavour and the poppyseeds gave a unique texture. The cream went well but there was a touch more than needed. But the sponge was overcooked. Let down by my go to place. Good thing I did a jog to counteract all that cream. Yes you heard correctly. Blog = jog is still going strong. I have to admit something I never thought I would say. I like jogging. I am a girl who used to jog once a year and decide it was horrible and give up until the next year. I thought people who ran for fun were insane. I have converted myself, for the moment. My only active moment on Sunday was the jog I went for at about 1 o’clock because I thought it was time to get up finally, and I actually found myself feeling good about doing exercise. Revelation. So that was Sunday. Now I am going to be out of London for the next two weeks for various wedding and birthday related reasons. None of them my own I hasten to add. This means I will not be able to blog about cake adventures and I have decided to ask if anybody else would like to do it for me. So if you love in London and fancy eating cake and writing me a review you could be on here next week! Just let me know. Atmosphere: 6/7 – relaxed but not too quiet and table water! You may not be able to tell from the photo but the portion sizes at Del’ Aziz are out of control. You will never find such large pieces of cake anywhere else. Ever. How do you spend your bank holidays? Relaxing? Adventuring? Getting out of the city? I turned my weekend around. Saturday became Sunday with its obligatory trip to the supermarket and Sunday became Saturday, with its cake trip and discovery of another new area of London Town. A rather hungover start I have to admit but I made it to Central London before 12! A success for any weekend when you like a lie in as much as I do. A lovely brunch in covent garden to catch up with a fantastic friend and a walk kicked off the day, followed by more walking to the British Museum. I wanted to see the Viking exhibition but we had to stop for more food on the way from a bizarre cafe down the road. Then we arrived only to find the exhibition was sold out. No Vikings for us! Not ones to be put off we spent some time looking at the Africa area. The BM is a truly wonderful place and however often I go there I still manage to find something I haven’t seen before. I feel I could have whole holidays there just looking at its treasures. I didn’t even go to see the Roman section which showed great self control. That is a section I know well already. I marvelled at African masks and bronze plaques from cities that used to be large and powerful. We had our fill of culture, or as much as one with only half a nights sleep can take, and went off in search of cake. 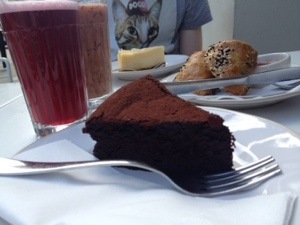 We walked to Clerkenwell and found Gail’s – an entry in the book – in a lovely quiet street called Exmouth Market. I love finding parts of London to explore that aren’t rammed with people on a weekend. That peaceful road away from a tube stop that only locals use. When people say to me they don’t like London because it is too busy I say they haven’t been to the right bits. Gail’s was quiet and the big table filling the centre of the room was scattered with tempting morsels. We immediately picked out the best looking sausage roll we have ever seen. Then chose a piece of cake each, although it was a difficult choice. 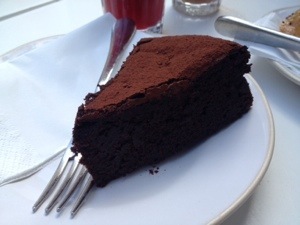 I had a flourless chocolate cake which was moist and dense and squidgy. I accidentally put my arm in it, because that’s just the kind of person I am, and I’m still trying to get the chocolate off my jacket. It wasn’t as chocolatey as I would have hoped. It had all the promise of texture but there was no big chocolate hit. Charlie had the white chocolate cheesecake which was a traditional American style. Well baked and a good chocolate flavour that would have left it rather plain otherwise. The stealer of the show however was the sausage roll. I know this is a cake blog but that was the meatiest, juiciest, herbiest sausage roll I have ever eaten. Ok I made up the word herbiest but I mean it. That not so humble looking sausage roll, packed with meat and served with homemade tomato sauce far outshone it’s cake rivals. Atmosphere: 4.5 – nice modern layout inside but our table was too cramped outside. 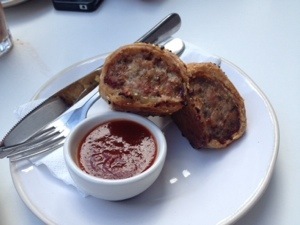 Post scriptum: having written about that sausage roll makes me want to eat it again! I will have to try and recreate for dinner tonight.